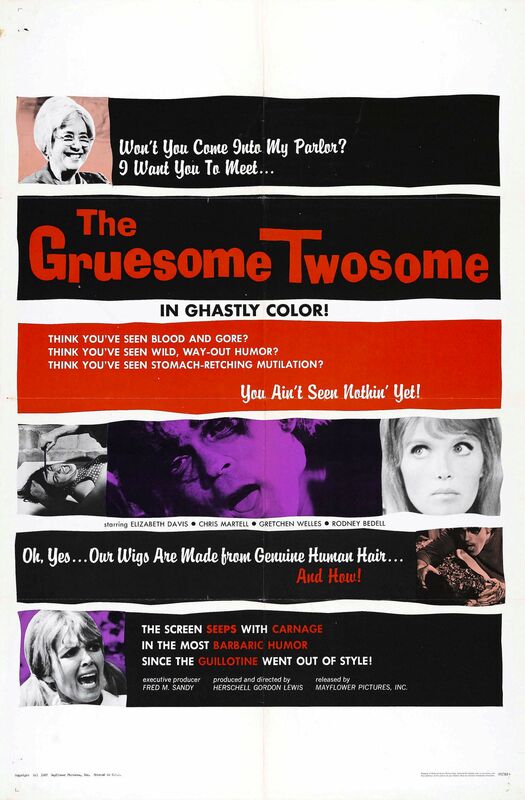 THE GRUESOME TWOSOME is a cherished title by some, though it often doesn’t get mentioned in the same reverent tones as Herschell Gordon Lewis’ other gore epics. There might be a good reason for that. Lewis often gained loose inspiration from existing material. For instance, TWO THOUSAND MANIACS contains plot elements of BRIGADOON, both of them involving a ghostly town that appears every number of years. But BRIGADOON took place in Ireland, not the American south. Also, no one got ripped limb from limb in the Rogers and Hammerstein musical, though in retrospect maybe they should have. To wit, GRUESOME TWOSOME involves elements of Sweeny Todd and Mrs. Lovett. Traditionally, Sweeny Todd would dispose of people by slitting their throats while Mrs. Lovett would bake the victims into her renowned meat pies. GRUESOME TWOSOME involves a similar pair of murder-for-profit miscreants, though that’s where the similarities end. For one, the film opens with one of Lewis’ brilliant surreal comic touches. Two wigged mannequin heads have a genial conversation with one another, their extravagant southern accents setting up the story. It immediately gives everything a really twisted slant. Lewis himself always bluntly downplayed any artistic aspirations in favor the business side of things, a carny at heart. However, I believe that Lewis had a very singular vision. How else to explain how his films are so garish yet amusing? The films themselves are so surreal, they have a nightmarish quality. And unlike most art house navel gazers, Lewis seems to have perhaps unintentionally realized that nightmares are indeed ragged and rough, turning the rules of the logical world on its head. Mrs. Pringle (Elizabeth Davis) is an eccentric old woman who runs a wig shop and has difficulty with the concept of an indoor speaking voice. Whenever a young coed shows up on her doorstep asking about the room she has for rent, she loudly speaks to her stuffed cat Napoleon (again with the HGL-patented crazy) before throwing them into a dingy back room where the girls meet Pringle’s mentally challenged son, Rodney. Rodney is a raving brute who gleefully scalps the women so mommy can have the most realistic wigs in town. Ironic that Mrs. Pringle’s own old lady wig is of the community theater variety. Kathy (Gretchen Wells) is a Nancy Drew wannabe whose “girl who cried wolf” shenanigans has everyone from her friends to her boyfriend wishing she would find another hobby. She investigates what’s going on with all these missing coeds and of course stumbles right into Mrs. Pringle’s varicose veined clutches. I have now seen five of Lewis’ seven original gore epics, leaving only COLOR ME BLOOD RED and A TASTE OF BLOOD unwatched. While not a bad film in its own right, THE GRUESOME TWOSOME is certainly the most underwhelming of the batch. The running time is padded out by long gags that go nowhere. Even the aforementioned opening was added in post when the film ran short. But while that was entertaining, scenes like a long sequence involving Kathy following a janitor around (pointless especially since we already know Pringle & Son are the culprits) seems to go on forever. It’s the type of thing one would expect to see in a Larry Buchanan or Barry Mahon film, but not necessarily Lewis. The acting is the worst I’ve seen in a Lewis film to date with Wells’ performance being especially egregious. Still, there are those moments of irreverence that help THE GRUESOME TWOSOME stand out. Pajama-clad coeds dance for no reason. There’s a scene at a drive-in where the fourth wall seems to be all but knocked down. And my favorite bit is a voice-over where a woman professes her love to a man who can’t stop feeding his face. He rummages through a bowl of potato chips to find that one burnt, chewy potato chip, a delicacy that he savors like caviar. These are the things that make Lewis’ films far more enjoyable than your garden variety drive-in flick of the era. Unfortunately, they are the only ones that make THE GRUESOME TWOSOME stand out at all. Barely Recommended. For the month of October, I and a number of other people are taking part in the 31 Days of Horror Challenge. Each day in October, we watch one horror film and share our opinions through social media. Because my reviews tend to run longer than what they’re supposed to, and because I never know when to stop myself, I’ll also be posting my reviews here as part of Moviocrity.com’s revitalization efforts.